That’s when the thunderclap nailed me with the force of its power. Right there, in my kitchen, I was struck with revelation. Cold hands can only mean one thing: it’s time to make pie. You see, I have had several pie teachers in my life, both of whom I admire for their tenacity as much as I cherish any time I get to spend with them. Their joy trickles over into the work of their hands and their breadth of tutelage extends far from their home bases. Both Kate and Evan will eagerly say that your hands are your most important tool in making pie crust and just as vehemently will caution not touching the dough too much lest they warm it up. Cold hands remedy all of that and I’m starting to wonder if they might be endowed upon people like a spiritual non-spiritual gift. Pie heals people. Case in point one: I attended a baby shower where each guest was instructed to bring a onesie for a game that is probably much more fun in theory than it is in practice as the befuddled mother stares from one onesie down at the whole cavalcade of partygoers trying to guess who gave what. Unless you think in navy blue polka dots or black tutus when you look at your friends, it can be a challenging feat. My onesie had developed a golden hue with a crusty disposition and just enough curry to make things interesting in the world of pumpkin pie land. While her soon-to-be newborn might be able to wear all of those onesies, my friend could nosh on the onesie I had bequeathed, a win in my book. Case in point two: I bagged up several duets of mini pumpkin curry hand pies on Sunday morning with a clear mission of playing the part of pie delivery girl, using the same rules that apply to those who deliver flowers. First up, our friend Thomas was rolling his grocery cart away from the patch of street where he sleeps. I hopped out of the car and handed him the small bag of warm pies, telling him that Beck and I are thankful for him. It gave me joy to see him gobbling away at one of them as we pulled away, reminding me of my baking oath I’ve planted in my heart to pepper him with baked goods. Next, at church, with my remaining bag I had to think carefully about where the two remaining pies would go. Thankfully, both intended recipients were present. I snuck one into Martha’s hands, as I told her how thankful I am for our friendship, and then later to Sara, whose pastry prowess and deep wisdom make me grateful. When we returned home, I bagged up some more, already deeply rooted in this new mission of mine. I attempted to deliver some to my favorite barista, but found he had already left for the day and thus, wound my way over to my favorite bookseller, delivering them to her with the proclamation that yes, I am thankful for her, even if my wallet isn’t. Cold hands paired with warming spices created this series of thanksgivings. Really, though, I’m of the mind that we don’t or perhaps, I don’t tell the people I care about that one word which can sometimes supplant or work in tandem with that oft-ignored four letter word. To give thanks for someone is to recognize something intrinsic within them of value. While, I too am looking forward to the dinner table decked out in the usual suspects later this week, it’s never too early or too late to tell people you’re thankful for them. So, reader, wherever you are, I’m holding hands out to you. Inside them is a golden flaky hand pie, its steam releasing a subtle spice into the air. I am so thankful for you too. 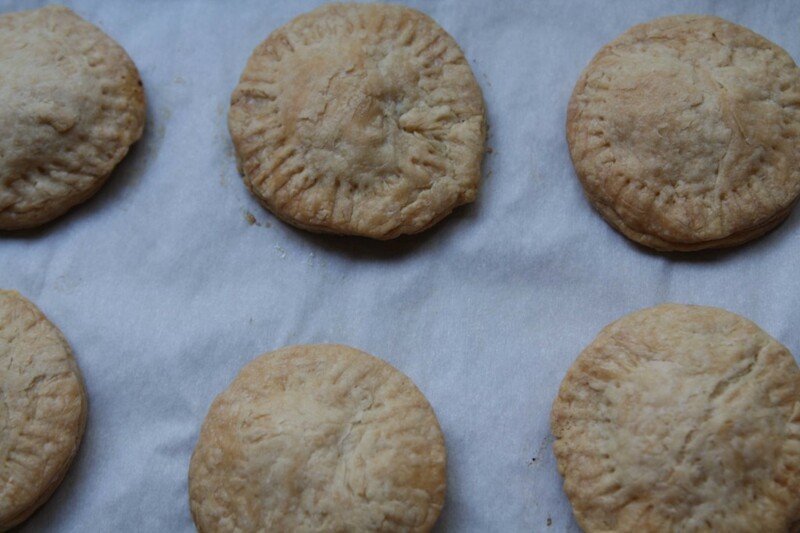 One portion of the double pie crust recipe linked below makes 12 hand pies. Since you have enough filling to stuff 24 hand pies, I would suggest making two batches of the double pie crust. 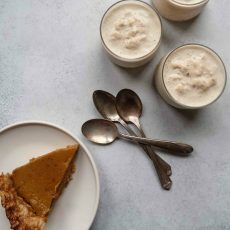 In your planning for pie-making using the method in the link, I recommend putting a small bowl with water in the freezer at the same time you put the large bowl in the refrigerator. This freezes the water into ice. What I have done that works marvelously well when setting up pie crust mise en place is to run some cold water over the frozen water. This ensures the water you are working with is as cold as can be, which you will need for making your pie crust. Also, another variation of mine from the pie crust method is to cut the butter into cubes before integrating it with flour as it makes it easier to crumble with your fingers. I use a biscuit cutter to cut out the rounds which works like a charm. 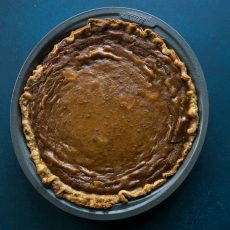 PS- Kate worked on this pie crust recipe for two and a half years, but it only takes you a short time to make fresh dough from scratch and is ridiculously easy. Trust me and try it if you’ve never made it by hand before. Preheat the oven to 350. Line two rimmed baking sheets with parchment paper. Set a small bowl with cold water to the side. Prep your pie dough. While it sets up in the refrigerator covered for 30 minutes, begin assembling the pumpkin puree. In the bowl of a food processor, spoon the pumpkin puree (or roasted sugar pumpkin chunks to make puree). Add the curry powder, egg, brown sugar, cream, salt, cinnamon and ginger. Pulse until combined and smooth. Sprinkle your workspace with flour and bring out one of the pie dough disks. With a rolling pin, push down and toward you from the middle of the disk. Then place the pin in the middle again and roll up. Now, turn the dough disk and repeat the roll out method. Keep turning and rolling until it’s about ¼ inch thick. 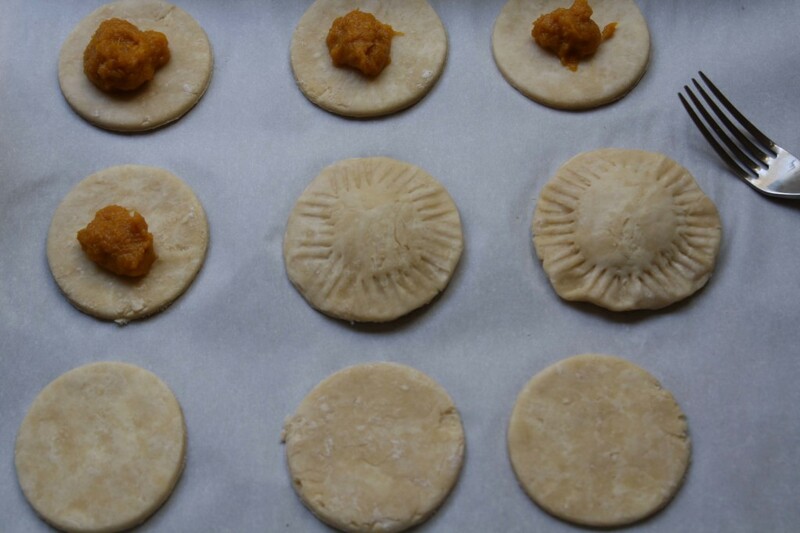 With a biscuit cutter, begin cutting out circles and place them on the parchment paper. In the center of each circle spoon a level teaspoon of the pumpkin filling. 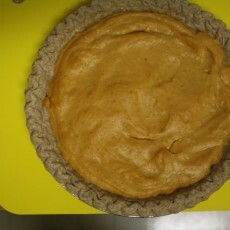 Dip your index finger into the cold water and trace your finger along the edge of the pie dough round. Place another pie dough round on top and crimp the edges at four alternate ends, working your finger around the periphery to bind them together. 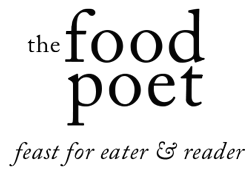 Press down on the edges of the pie round with the tines of a fork. Bake for 1 hour to 1 hour 10 minutes until golden brown. Place them on a wire rack to cool for about 10 minutes before devouring.